So much fun! All over the neighborhood! And speaking of Noble Road, we're celebrating that the Road is being repaired! NobleFest will feature carnival games & prizes, bounce houses and a variety of food options - all at affordable prices. Community vendors will have tables with their goods for sale, and several new activities are being planned. Bring the whole family to the Noble Elementary School Playground for an evening of fun! Volunteers are always welcome! Scroll down to How Do I...? to learn how to volunteer. Noble Road Presbyterian Church, 2780 Noble is hosting this award winning 2016 movie that tells the story of three remarkable pioneering African American women mathematicians who served a vital role in NASA during the early years of the US space program. Grab dinner one block away at NobleFest, them come to the Kirkwood (side street) entrance for the movie! We are especially pleased to announce that Jake Hockendoner, Our Own professional documentary filmmaker will capture video throughout the weekend. Watch for the Noble Neighborhood Promotional Video to be posted this summer! will host an Open House & Tool Sale. Come visit their teaching center at 2520 Noble Road to learn about their services, tool library and contractor evaluation books. Basic hand tools, specialty tools and ladders will be sold, too. No need to register for this event. Just come and learn how HRRC can help you keep your house in good repair. HRRC will also be the launch site for tours of houses for sale in the neighborhood. Real estate agents, lenders and inspectors will tell you about houses for sale in the neighborhood, talk to you about financing and inspections. Take a tour on the van of some of our sale homes that have yard sales! On Saturday the Academy will be open with the bomb squad present, K9 Officer and partner, and other officers. Check out the CHPD museum inside. This is a really cool building! Oxford School Carnival will be abuzz with activity on Saturday afternoon. Food, vendors, the Science Fair, games, prizes, live DJ, dance contest, family chalk art contest, Bounce House, playgrounds, field day events, and a Color-A-Thon race with a color explosion kick-off! Want to be a vendor, enter the Color-A-Thon race or help fund this spectacular day? Scroll below to How Do I...? Also at Oxford School, and back by popular demand are tours of the WPA murals, hydrocal relief sculpture and ceramic figures. These treasures are rarely visible to the public, so join a tour! Ice cream social, Games, Music, and ”Holiness and Wholeness”, intergenerational family events that combines exercise, nutrition, spiritual wellness and fun. Activities in the Children’s Room and our garden for families. Look for the book give-away. There will be a public arts project on Saturday as well as a potluck hosted by the Noble area Nepali community, 3 - 5pm during Welcome Hub hours in the teen room. Welcome Hub is a weekly program for refugees in the community, but anybody is welcome to attend and bring a dish if they like. Meet fellow Cleveland Heights Young Professionals at Christopher's Pub for an evening of trivia, games and networking (bring your business cards). Look for the Facebook event page: Cleveland Heights Young Professionals Mixer. Visit the Noble Neighbors of Cleveland Heights Facebook page and We Are Noble FB event page, Twitter and Instagram for more details. We Are Noble. We are home. We are excited to share our home with you! ... Hold a yard sale? Great! we need sales all over the neighborhood to draw people in. 1. 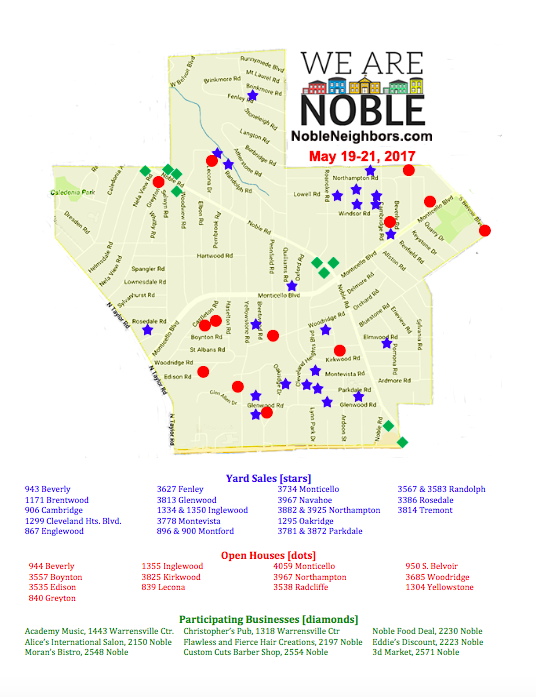 Send an email to NobleNeighbors@gmail.com with your yard sale address BY MAY 12 to get your street on our map. Only your address. We'll map your street, but not your sale items - those details happen in the next step. 4. Print maps from our web page to hand out to your visitors. Help them find other sales and events. You can find the completed maps after May 16 at the bottom of this page. ...Volunteer for NobleFest? 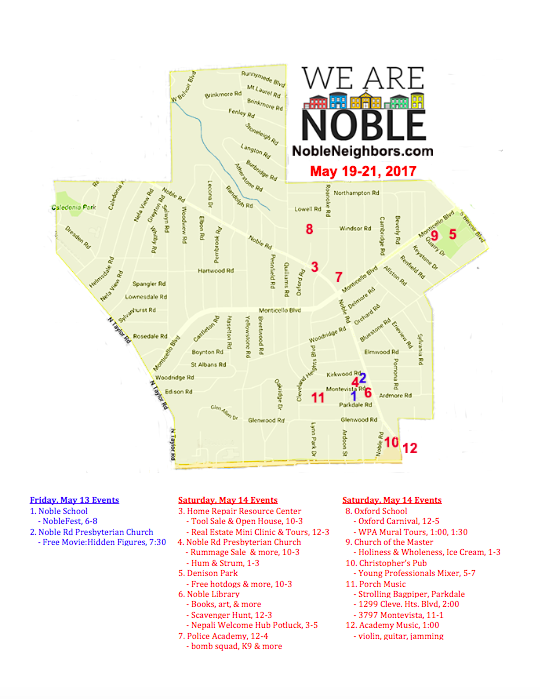 NobleFest at Noble Elementary School is right around the corner! We need volunteers to make this event happen! Please use the sign up link below to indicate when you will be able to help out! Please let us know if you have any questions! Thank you in advance for your support of this awesome event for our students, families, and community! ...Support Oxford PTA's Carnival? Wonderful! They would love to do everything they have planned, but still need funding. Go to their Go Fund Me page, https://www.gofundme.com/oxford-elementary-2017-carnival or bring your donation to the school office, checks payable to Oxford Elementary School PTA. ...Get a map of We Are Noble events? Helpful! Scroll down - the Google interactive map is there. Click on and off layers to help you navigate the neighborhood. You can use it on your phone! The Printable Map has two pages. Click on either page and you will get both to print in color or black and white. ...Participate with my business or organization? Join us! This is all about showcasing the best of our neighborhood! Just email us before May 12: NobleNeighbors@gmail.com to tell us how your Noble Road business is having a great special or tell us how your church or other organization will host fabulous fun. We'll put you on the map! Not from this neighborhood? Consider renting booth space at the Oxford Carnival - scroll up a bit for that info. ​...Print a copy of the flyer so I can pass it out to my neighbors? in the margin, then print many copies from this one to hand out. Some have encouraged others on the street to have yard sales, others encouraged folks to attend events. Maybe you could also suggest getting together for a block party this summer! To download a copy of the flyer, click here. ...Help fund Noble Neighbors and We Are Noble? So glad you asked! On the side bar to the right (and toward the top of this page), you'll see a Donate button. While every Noble Neighbor is a volunteer, we do have expenses for advertising, signage, our perennial gardens, and event rentals. We could do so much more if... Thanks for helping! ...Avoid orange barrels? Ah, would that we could! Yes, it's a bit annoying that road construction is happening this weekend, but we who have travelled these potholes daily are quite thrilled (well, maybe the thrill part won't happen until its all over) to have Noble Road repaired. So, look on the bright side with us! 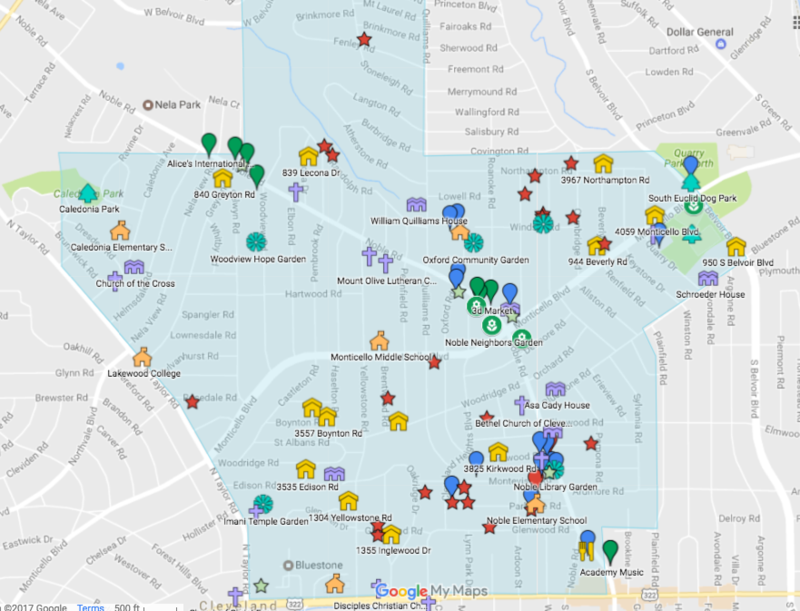 Click on the map for our Google Interactive Map. You'll see layers for information which you can click on and off as you are searching for places to visit. Our Printable Map has events lists and sale locations. Click on either map below, the file has both pages. Print in color or B&W.